Pollution, traffic dust, leaves and even bird droppings contribute to preventing sunlight from reaching the solar cells and make it inefficient. The more dirt – the lower amount of electricity it will produce. The loss of power in solar PV panels is a major cause of concern due to the Soiling losses. That is more difficult when you have the roof-mounted solar panels, which are beyond one’s reach for cleaning and maintenance. The typical particles are less than 10 µm in diameter but this depends on the location and its environment. Based on the nature of semiconductors used in solar cells, it limits the PV system efficiency to 15-20%. Installation of the sun trackers and maximum power point tracking controllers could increase the overall efficiency. That loss may range as high as 25% in some areas according to the National Renewable Energy laboratory. 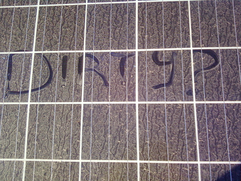 Individual dealers have reported losses as high as 30% for some customers who failed to ever clean their panels. 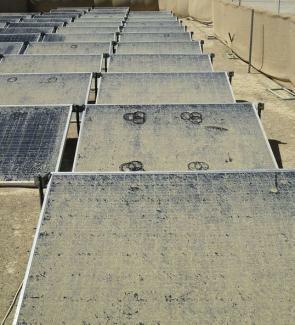 To address this issue, the SolarClear introduces a fully automatic cleaning system that creates a laminar cascade of water down the panel and effectively moving free soil, dust, grit, etc that gives the maximum output of the PV modules. Edwin Humphries and Andrew Petersen, the principals of the SolarClear, created a sustainable conscious company in the Illawarra region of NSW, Australia. SolarClear was the idea of Edwin’s wife, who suggested Edwin transfer what he learned in developing a cleaning system for sun photometer lenses to solar panels. There are many merits of the SolarClear system such as its affordable, reliable, regular, safe for panels, easy operation, and saves water for cleaning. It consists of two sub-systems: the controller, and the on-panel water delivery system. The controller manages the filtering of the water, the timing, frequency and length of water delivery, water pressure and the addition of water softening agents, during the course of water delivery. While the on-panel water delivery system delivers the water in jets that evenly, disperse the water in a way that causes a turbulent cascade of water down the panel, ensuring effective removal of soil build-up on the surface. Below is a map that depicts the results of some of the studies around the world on the effects of dust on solar panel efficiency. It is a cheaper option to homeowners with just 1.5kW arrays (8-9 panels), and scalable (in its present form) up to 60 panels (12-15kW), the company said. To enhance the effectiveness, a small quantity of flow agent is mixed for better cleaning and the panel dries without residue. It uses any water - town water, rainwater, bore water or even dam water and consumes only around 2.5 liters/panel, which is less than 1% of an average household water use. According to the company, the SolarClear systems cost based on the number of panels (as a general guide). It’s estimated around $1,420, $1,680, $1,940 for 10, 20 and 30 numbers of solar panels respectively.